Gretchen Pusch, flute, made her Carnegie Recital Hall debut as winner of the Artists International Competition. 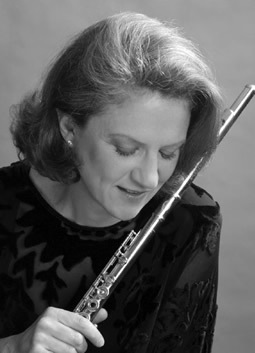 She is a member of the Dorian Wind Quintet and has collaborated with Flute Force, Musicians’ Accor, Paula Robison, Julius Baker, Anthony Newman, and Peter Schickele. She has performed with the Brooklyn Philharmonic, American Symphony, American Composers’ Orchestra, New Jersey Symphony, and on Broadway. Gretchen has recorded for CRI, VAI, Innova, Mode, Newport Classic, Windham Hill, and Panasonic Japan. She teaches at Julliard and the International Festival Institute at Round Top.